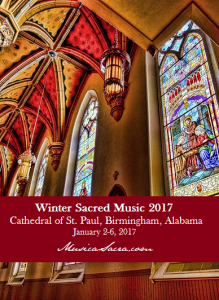 The Music Book for the 2017 WINTER SACRED MUSIC (Birmingham, AL, January 2-6, 2017) is now available online! You’ll receive a printed copy when you check in to registration in Birmingham, but you can get a look at it here in advance. There is still time to register for Winter Sacred Music… come and join us in Birmingham in January and make some beautiful music. WINTER SACRED MUSIC WEBPAGE (for all the details).